Today is a huge milestone day, celebrating the official publication of my fourth book, The Women’s Football Encyclopedia! The book is now officially published, and the first run of books arrived on January 29. I’m so excited to be able to share it with you! The title of this book was carefully chosen. Its very name, The Women’s Football Encyclopedia, carries within it a substantial pledge. As the encyclopedia of this sport, this book creates an expectation that it will be a definitive look at the history, evolution, and current state of women’s football. I truly believe that this book delivers on that weighty promise. The Women’s Football Encyclopedia is the most comprehensive book ever written on women’s football. The Women’s Football Encyclopedia is filled with essays detailing the history of the sport and contains an immense amount of data on women’s football at every level. There are two particularly notable sections of the book. The first is the league section, where every league, current and defunct, is covered. In this section, you can take a chronological look at the history of women’s football, year-by-year, league-by-league. This excerpt illustrates how the league section is handled and the incredible amount of information contained within The Women’s Football Encyclopedia. Reading through this section literally provides a yearly recap of every season of women’s football from 1999 through the recent 2015 season. The second major section of the book is the franchise section. Nearly 300 current and defunct women’s football teams are covered in The Women’s Football Encyclopedia. What’s your favorite team? Take a look at their yearly records, playoff finishes, and every single game and opponent they’ve played in their entire history. Also, for many franchises, there is an all-time player register that lists the women who have suited up for that team; over 10,000 female football players are listed by name in this book, cementing their status as pioneers of this great sport. This excerpt shows how the franchise section details the history of every team that has played in the United States since 1999. There are also chapters on the “first era” of women’s football in the 20th century, a women’s football record book recognizing league champions and team records, and coverage of international leagues in ten countries outside of the United States. Take a look at this post for a more detailed description of what’s inside the book. If you have ever played or been associated with women’s football in any capacity – or even if you’re just someone who is curious to know more about this sport – The Women’s Football Encyclopedia is a book you have to own! The Women’s Football Encyclopedia will be available for purchase on Amazon and other online retailers in about a month or so. But until then, the only place to get your hands on a copy of The Women’s Football Encyclopedia is right here! Place your order today and get one of the first copies off the line. 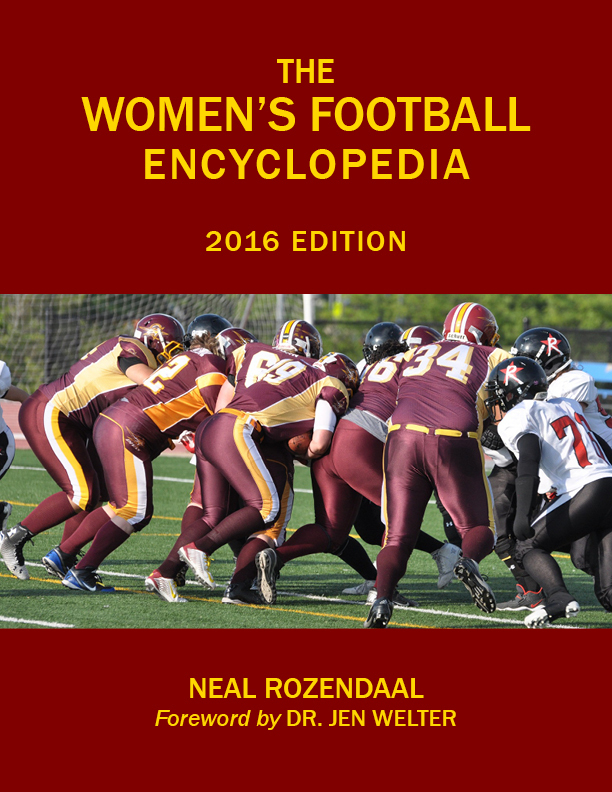 The price of The Women’s Football Encyclopedia is $30 with free shipping included. I can promise you, at over 400 pages…you’ll be getting your money’s worth! The first 100 copies from the initial run are signed and hand-numbered by yours truly, but they are already moving quickly – so if you want one, reserve your copy today. Thank you for your support of this book and women’s football! Yes…free shipping worldwide! I might lose a little money on that one copy, but it would be worth it to spread some women’s football love all the way to France!